Boskel Smokeless Flare technology was developed to address environmental problems created by excessive smoky gas flaring prevalent in the Niger-Delta region of Nigeria. 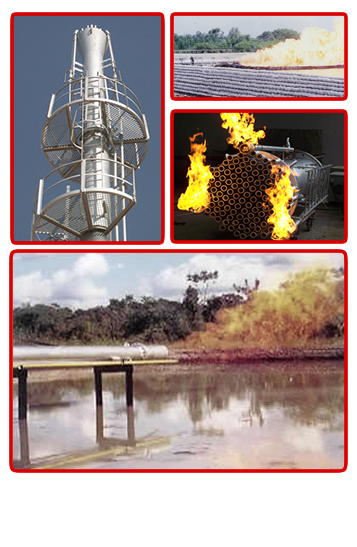 Since the first pilot tests where completed in 1992, Boskel Smokeless Flare technology has significantly matured and over 200+ units have been designed, built, and installed for various clients in Nigeria and internationally including Shell Petroleum, AGIP, etc. Based on the client specifications Boskel Smokeless Flare are designed and fabricated for rigidity, and longevity. Most Boskel Smokeless Flares are currently being used in some of the harshest conditions in the world and have life spans in excess of 10 years. Our Flares come in both horizontal and vertical varieties and burn waste hydrocarbon gases over a wide range of gas from flowrates less than 1MMscf/d to 30MMscf/d. They do not require any ancillary equipment or utilities to effect the Smokeless operation. They are passive and reliable. They are stable in very high crosswinds. They are guaranteed for 12 months after installation. Our Flares meet the standards of the air control board of the United States of America, and meet the standards set by the Federal Environment Protection Agency, the Department of Petroleum Resources of Nigeria, and other relevant Environmental agencies.